Sri City, February 4, 2016:- The Department of Posts, Kurnool region convened a two-day study programme for its officers on Thursday in Sri City. All the Group A and B officers of the department attended the conclave, which was intended to review the progress of their activities and decide on the future endeavours. Also, they will study and explore the postal business opportunities in Sri City. Mr. T.A.V. Sarma, Superintendent of Post Offices, Tirupati Division, Tirupati welcomed the delegates and invitees. Mr. Sanjiv Ranjan, I.P.S., Post Master General, Kurnool Region, presided over the inaugural session. 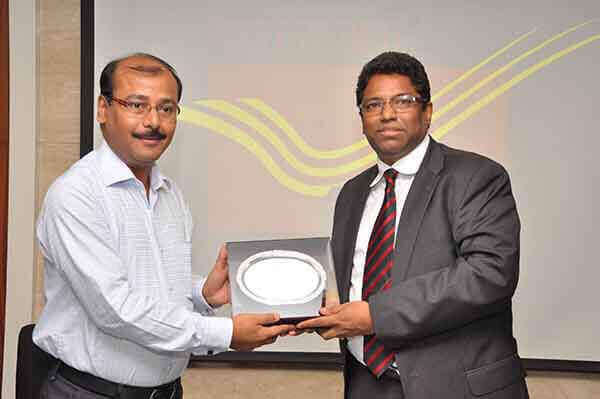 Mr. Ravindra Sannareddy, Managing Director, Sri City was the chief guest of the session. Mr. Ravindra Sannareddy in his speech highlighted the business potential of various services and appealed the Postal authorities to offer innovative services suiting the needs of international clients and a large vibrant community in Sri City. So as to streamline various services and ensure timely delivery of postal articles, he urged PMG to consider whether a dedicated post office with an independent pin code be sanctioned to Sri City. He promised to extend all support needed from Sri City side in this regard. Mr. Sanjiv Ranjan positively responded and said the department is seriously considering to open shortly a world-class delivery post office, equipped with all the state-of-the-art facilities and equipment. He further said, so as simplify the addresses of various locations in Sri City, irrespective of the Mandals in which the are situated, an independent pin code will be allotted. To make the addresses more specific and simple, he said, the postal department will coin unique beat & sub-beat notation. Briefing about ‘My Stamp’ service, Mr Sanjiv Ranjan said that such stamps, made on specific themes or logos will serve as an effective publicity tool to industries. He presented one such stamp set made with Sri City logo to Sri City Managing Director. Later, addressing the local media persons, the PMG said the Sri City post office would offer all services, including mail services, track and trace Speed Post, financial inclusion, parcel services, philately, Postal Life Insurance (PLI), etc., For speedy delivery of consignments and other articles, he said a dedicated daily ‘motor mail service’ will be introduced between Sri City and Tirupati. Later, depending on the feasibility, such service will be extended between Sri City-Chennai and Bangalore, he added. About 80 officials from five districts have attended the conclave. Tomorrow, the delegates of the meeting will visit different areas of Sri City and get exposure on various industrial units and their location.